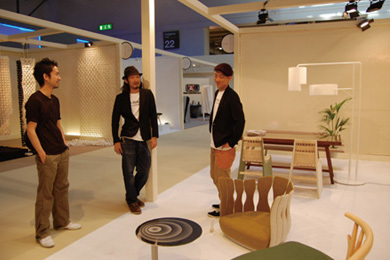 Leif.designpark is a design office based in Japan, consisting of Takashi Ueno and Mamoru Naito Keizaburo Honda and Mizuho Naito. Our main work is widely ranged from interior design to art and industrial products. By cooperating with specialists from arts and crafts friends, we maintain the highest quality production. Leif.s overall consept of the "design park" is comprised of a virtual drawing board. This is a park surrounded bya low hedge, and can be accessed freely. The object is to broaden Leif.designpark, in conjunction with the individual participants. In this way, we can share projects with people from a variety of fields. Graduated the Craft, Interior & Industrial Department of Musashino Art University, majoring in metal work. Joined the Design Planning department of Idee Co., Ltd. In charge of custom designing, directs restaurants, apparel stores and other public projects. Left Idee Co., Ltd. and became a freelance designer. Sets up Leif.designpark with partner, Mamoru Naito. Graduated the Craft, Interior & Industrial Depatment of Musashino Art University, majoring in wood work. Completed the postgraduate course in wood craft in the Craft Department of Tokyo Art University. Worked as a teaching support for the Wood Craft course in Musashino Art University. Became an assistant staff of the Wood Craft course in Musashino Art University. Sets up Leif.designpark with partner, Takashi Ueno Currently a member of Leif.designpark while working as an assistant staff at the Musashino Art University. Graduated the Craft, Interior & Industrial Department of Musashino Art University, majoring in wood work. Finished the Interior Design course of the Craft, Interior & Industrial Department of the Musashino Art University. Joined the product development section of Nagano Interior Industry Co., Ltd. In charge of original furniture design. Joined Sasaki Design International Inc.as manager of designing division. COPYRIGHT LEIF.DESIGNPARK ALL RIGHT RESERVED.